Currently, our library satisfaction studies are made by using SECABA2, a web application that allows to capture library user opinion polls using the LibQUAL+TM model. 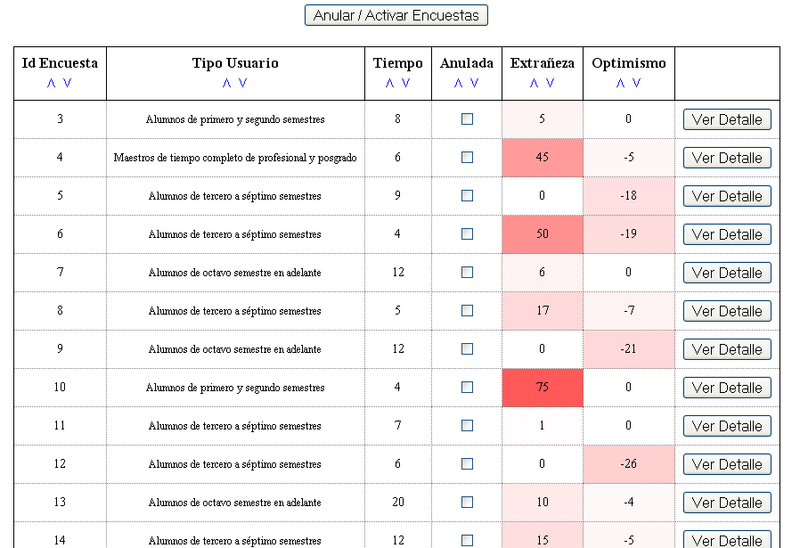 The polls allow the inclusion of several types of questions(diferent options, free text fields, minimum, desired and observed levels, and so on) and allows to group them into different categories that can be later aggregated and studied. 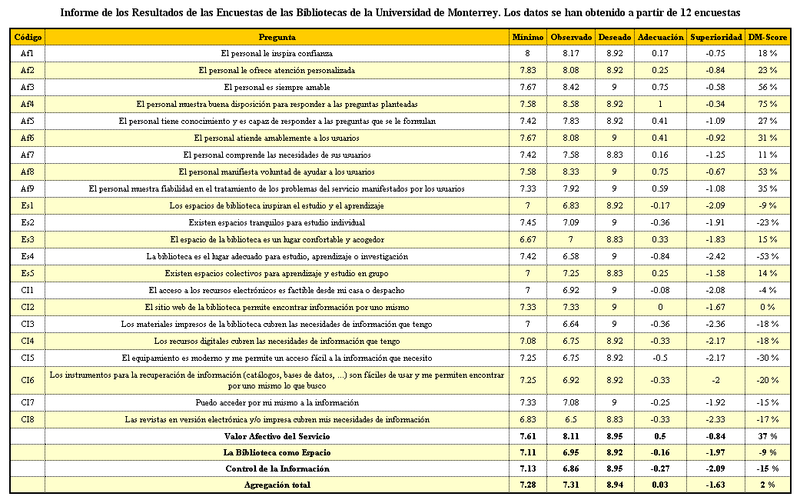 The application is able to perform some analysis with the polls data and to produce some different statistical graphs that can be later used to create satisfaction studies about the libraries. 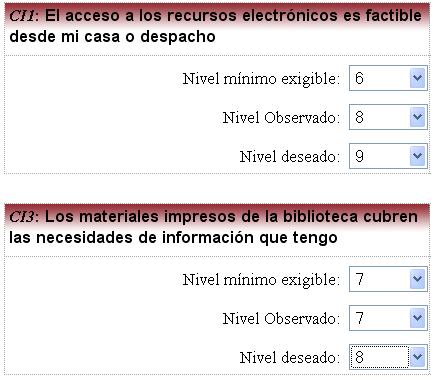 All the polls and reports generated by the application can be customized to the different needs of the library and adapted to both English and Spanish languages. In the following we present some examples of the library users polls and statistical graphs that the SECABA2 application automatically generates. Graph that aggregates the user opinions about a particuar library. 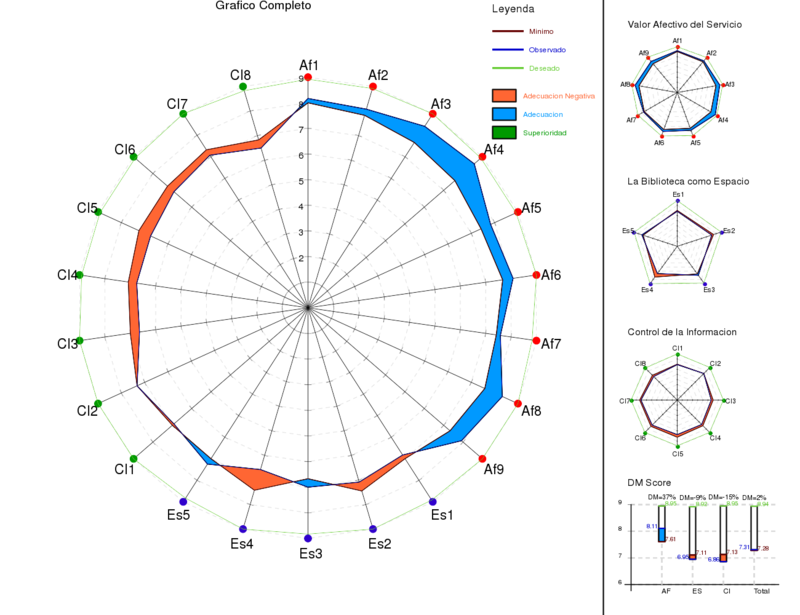 In every axis the minimum, desired and observed level are depicted in different colors which allows the easy identification of the good or bad points for the library. Note that the global graph (bigger) is also splited into smaller category independent graphs to be able to study groups of related questions separately. 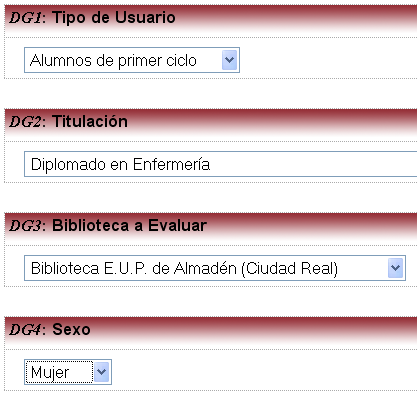 Aditionally, several numerical scores are computed about every particular aspect of the library. 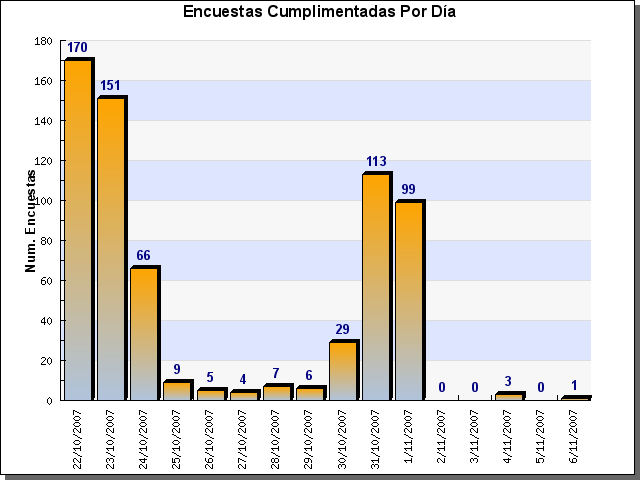 Other statistical graphs depict the evolution of the polls introduced by the users during the time of the data adquisition phase. Additionally, the application eases the task of finding inconsistent or erroneous polls (the ones that are partially not completed of with exaggerated good or bad opinions) in order to avoid them in the final computations if desired. To do so it defines new measures for each poll which identify those kind of polls. If you wish to make a user satisfaction study about your library, please contact us with the details about your library and an email address to contact you.